This 2nd, colored edition of Español para chicos y grandes ll also features, at the end of each chapter, the amusing cartoon episode of Las aventures de Bobi y Cuqui, an expanded edition of the characters introduced in Level 1 and much loved by students. 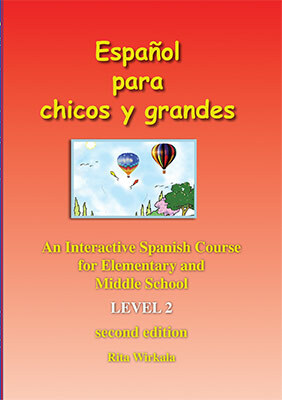 This 2nd, colored edition of Spanish for Children and Parents, Level 2, is the continuation of Spanish for Children and Parents, Level 1. Beginning with a review of regular verbs in the present tense as well as some previously-studied irregular verbs, it proceeds to introduce more grammar. The emphasis in Level 2 is on Spanish irregular verbs, object pronouns, reflexive forms, command forms, preterit and imperfect tenses, and a rich new vocabulary. We have included a cultural note on Spanish speaking countries at the end of each chapter. This gives students information about each region. Special attention is given to environmental issues. The Spanish for Children and Parents, Level 2 Textbook, is also accompanied by a Grammar and Vocabulary Exercises Manual and CD focusing on written, auditory and oral practice in order to begin writing, understanding and speaking Spanish. The book, which continues the previous format, features amusing new as well as previous cartoon characters.